Thigh Gun Holster. For ladies who don’t want to be limited to what they can wear in order to conceal carry. Now you can carry concealed, even in your form-fitting skirts and dresses. Ladies, with the Thigh Gun Holster, you can wear what you want! You wear the thigh gun holster around your thigh and secured it with hook and loop closures. No more risky off-body concealed carry in your purse. The Thigh Gun Holster allows you to wear your pistol or revolver on the inside or outside of your thigh. The retention strap keeps your gun securely in place. It can be trimmed to fit your specific gun. Made of high-quality, breathable, four-inch elastic with hook and loop closure. This specially made elastic has a plush finish on the side that touches your skin for a smooth, comfortable all-day or night fit. The hook and loop closure ensures a secure, adjustable fit and easy on and off. Available in black and beautifully accented with purple decorative lace. Available in 4 lengths, Small (18-21″), Medium (22-25″), Large (26-29”) and XLarge (30-33″). Use a measuring tape to measure around fullest part of the thigh, about 5 or 6 inches above your knee for best fit. This holster is intended for small to subcompact, lightweight pistols or revolvers with single stack magazines. Right Hand Draw. Left Hand Draw models made to order. If you like or need to wear skirts or dresses, there isn’t a better concealed carry solution. Order right now! The Self-Defense Guideline Card! The seven steps you must take to keep you from going to prison if you ever have to use your gun in self-defense. This card reveals, step-by-step, exactly what to do after the confrontation ends and the confusion begins. It contains vital information to protect you! If you carry a gun for protection, you can’t afford to be without this card in your wallet or purse. Now you can get this card absolutely free, just by trying the Thigh Gun Holster! Fits most handguns such as Glock 43, Sig Sauer P365, Beretta NANO, PICO, Springfield, M&P Shield, Ruger LC9, Taurus, Kahr PM9/CM9, Kimber, Kel Tec, Bersa, Walther, S&W, 380, 40 Auto, 38 special, 45 ACP, 357, 9mm, and many more. Small: 18-21", Medium: 22-25", Large: 26-29", XLarge: 30-33"
If in-between sizes, choose smaller size. I really like this holster. I would have liked a better explanation of how to wear (I’m new to CC) but I have a problem with the lace creating a bulge and figuring out all the straps. I guess I just have to play with it to figure it out. It is well made and I know I will love it once I get it just right. Gets the job done! I wear it to work and out around town, never again will my gun be in my purse. I carry my Glock 42 and it is undetectable. Holds my Pico perfectly, recommended and at a good price point. Looks good and works. Very happy camper so far. Cute holster and effective holster . 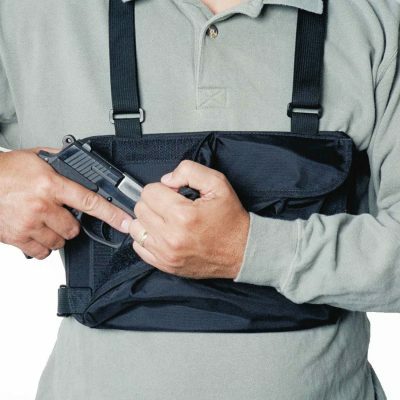 Easy to wear and if you have a light gun the waist strap is not needed. No one at work has the slightest idea its on, very satisfied! I now own one in white and black. I have recommended to various friends it works good and comfortable. Add on top of that it is half the price compared to some competitors. Have used for 2 weeks now and i am very happy with it.